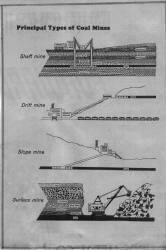 There are four main types of coal mines: shaft mine, slope mine, drift mine, and surface (open-cast) mine. The mine at Coalwood was a shaft mine; the coal was brought up in an elevator from 600 to 800 feet underground. 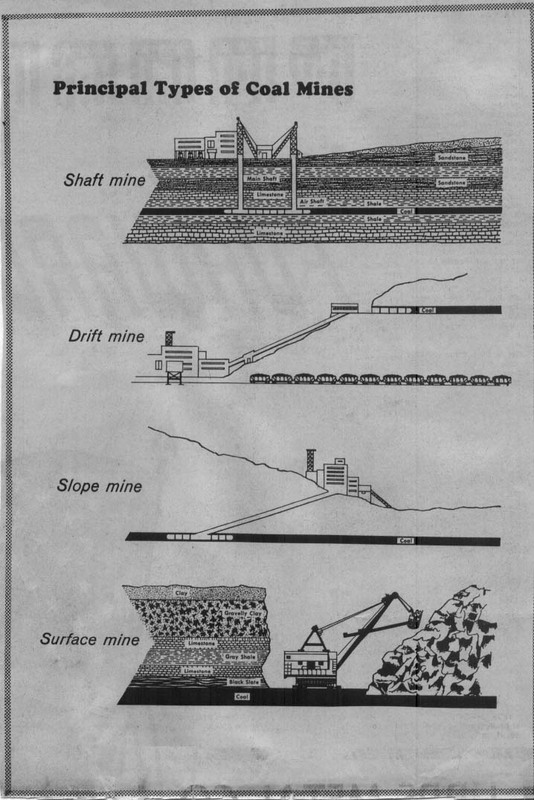 The University of Kentucky has an interesting diagram showing each of the four types of mining. Click here to visit UK's page with a larger drawing and explanatory text. 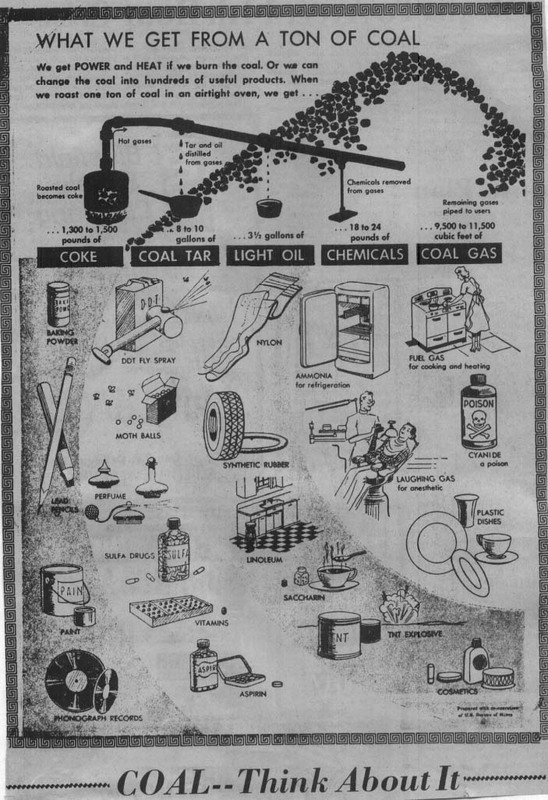 The two drawings above are from the Welch Daily News "1974 11th Coal Edition" which had articles about the West Virginia coal industry. We think these two drawing were actually from an earlier United State Bureau of Mines pamphlet. Courtesy of the R. Tim Gilley collection. You may click on a picture to enlarge it. 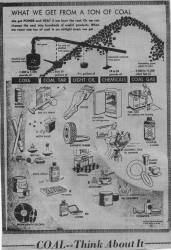 Below are copyrighted images available in the Virginia Tech Digital Library and Archives. Their web site is: http://scholar.lib.vt.edu. (If you want to explore their site for additional pictures, click on "ImageBase" at the top of their home page; then "Browse" on the left side of the next page.) We are not allowed to download the full-size pictures to our server; we can only display small thumbnails. However, we provide a link under each picture which will show you the full-size picture on the Virginia Tech web site. We have been given permission from Virginia Tech to display these links. The Pocahontas Exhibition Mine offers visitors a chance to walk through a real coal mine. In addition, there is a museum with lots of coal memorabilia. Please click here for details. The Beckley Exhibition Mine offers visitors the chance to ride a mantrip into a real coal mine. There is also a museum on site as well as numerous historical buildings from coal towns. Please click here for details. From the NCHA web site: "The National Coal Heritage Area (NCHA) is one of only 22 nationally designated heritage areas in the entire United States. It represents a part of the growing effort by the National Park Service to develop resource protection initiatives for areas of national importance that rely on partnerships and private ownership rather than the traditional methods of Federally owned parklands. The mission of the National Coal Heritage Area is to preserve, protect, and interpret lands, structures, and communities associated with the coal mining heritage of West Virginia. The NCHA encompasses 11 counties in southern West Virginia: Boone, Cabell, Fayette, Logan, McDowell, Mercer, Mingo, Raleigh, Summers, Wayne, and Wyoming." Christy Bailey, Executive Director, National Coal Heritage Area Authority, and the Coal Heritage Highway Authority, tells us: "Coalwood remains as one of the most intact communities along the Coal Heritage Trail and within the National Coal Heritage Area." The NCHA web site is being revised in late 2005 and will show much more detail about the plans of the organization. For example, which counties produce the most coal. A trade group dedicated to informing and educating West Virginia citizens about the coal industry and its vital role in the state's future. Contains interesting statistics on West Virginia coal and many links to other web sites. A 115-page college thesis on how mechanization affected the population of McDowell County. As mines became more mechanized, the number of jobs for miners fell, and these people were forced to move out of the county in search of work. 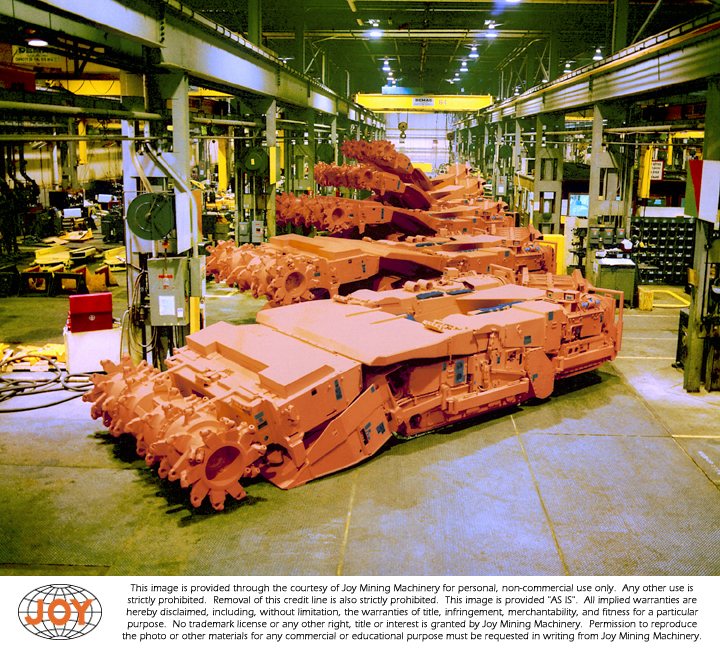 Headquartered in Warrendale, Pennsylvania, Joy Mining Machinery employs 4,500 persons worldwide. 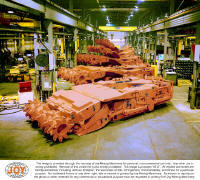 Joy is one of the largest (if not the largest) manufacturer of underground coal mining equipment. We heard several women in the Coalwood area make statements like, "My husband used to operate a Joy." Keep in mind that the 13-foot coal seam at the Pocahontas Exhibition Mine is a very high coal seam. According to our museum guide, the average height of a coal seam today is only 26 inches (yes, inches). The miner actually lies down inside the Joy continuous miner and stays in it all day as the machine tunnels its way through the coal seam. This is an interesting web site that was dedicated to trying to get the United States Postal Service to issue a stamp honoring coal miners. The group sponsoring the effort collected over 80,000 signatures requesting the stamp; however, due to the deaths of some of their key members, they seem to have given up on their effort. The photo above is downloaded from their web site. 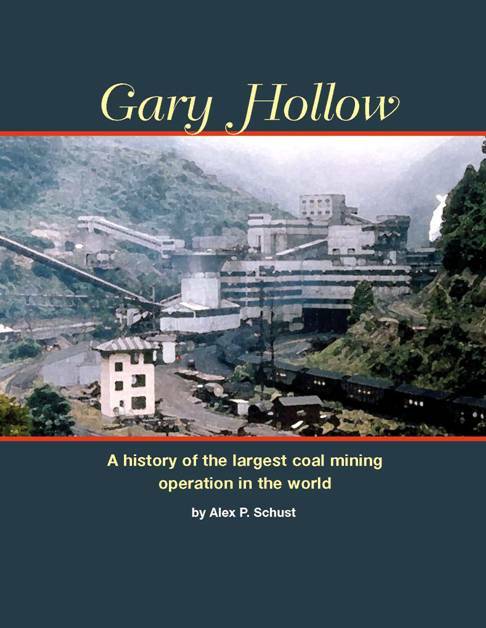 Alex P. Schust's 480-page hardback book presents the history of Gary Hollow. 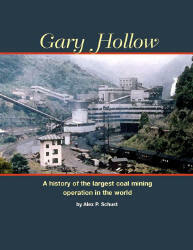 The book is subtitled, "A history of the largest coal mining operation in the world." (Gary Hollow is over two mountains from Coalwood.) The book is for sale from Mr. Schust's web site. www.GaryHollow.com.